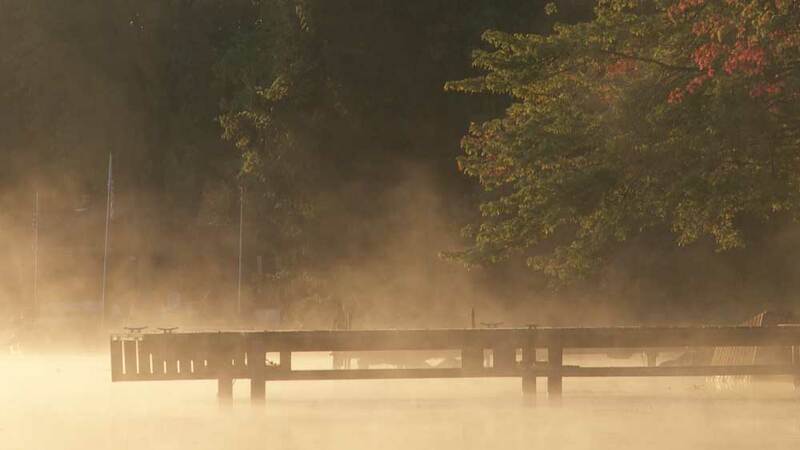 Do you dream of escaping the cold northern winter on your boat? For sailors on the American East Coast the Intracoastal waterway is a great resource and fun trip south. 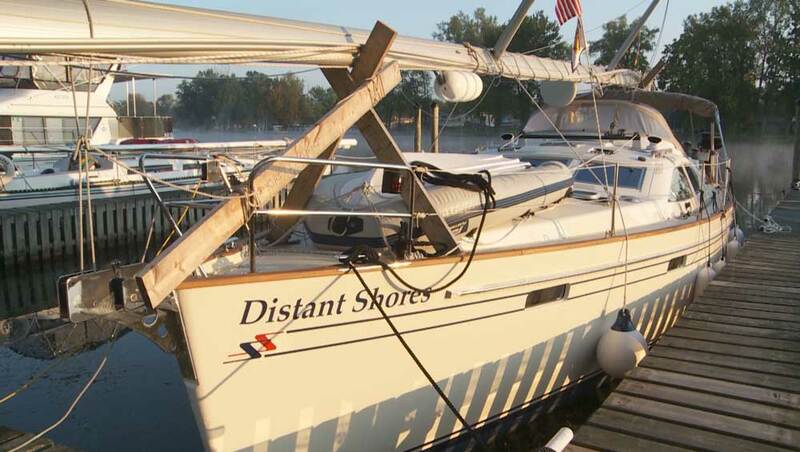 For boaters on the Great Lakes, the first step is to get out to the coast. Our favourite route is to use the Erie Canal to get to the Hudson River and New York City. We have done this trip Southbound 3 times, leaving Canada from August 29 up to September 21. If you then take your time enjoying the trip south you will not arrive in the Hurricane Belt before the finish of the hurricane season in November. BTW you should check your insurance policy to see what their dates are for hurricane season (often finishing November 1). We recommend arriving at the Erie Canal early to mid-September. So if you come from further up the system you can work the dates back from there. Leave before it gets too cold crossing New York via the Erie Canal. The Erie closes mid-November but that would mean a cold trip. Our late-September trips were very nice with frost a few mornings and fall colours on the trees. Hurricanes - some insurance want you to stay north of 35 degrees until after Hurricane Season - That's around Oriental North Carolina - and partially explains the popularity of this destination :-) Of course other companies insure boaters south of this zone. Check your policy! Many sailors try to get to Annapolis on the Chesapeake Bay in time for the US Sailboat show early October. Annapolis is about 250 nautical miles from New York City. We plan a week for this at least - more if you plan to explore along the way. Remember there could be weather delays on this route as you go out in the ocean to the Delaware Bay. If you get in a few days early you might snag a mooring in Spa Creek right by the show (or in Back Creek nearby). Then you can spend the time at the show buying those last minute must-have boat purchases. You need to take your mast down to allow for the clearance in the canal (http://www.canals.ny.gov/about/about.html#heights) Basically 20 feet clearance for our Route from Oswego to the Hudson, or 15.5 feet if you come the Erie Canal all the way from Tonawanda (Buffalo). We have always carried the mast. Plan a sturdy system to support the mast. Waves on Lake Oneida will not look large compared to ocean conditions but even a small bounce can get a harmonic motion going if your mast isn't well braced and supported. Note above how I have made a tripod so the forward leg stops the mast moving for and aft. Transiting the locks means you'll come up against the rough lock walls, docking and moving up and down the side many times a day. Your regular fender strategy probably won't offer sufficient protection. 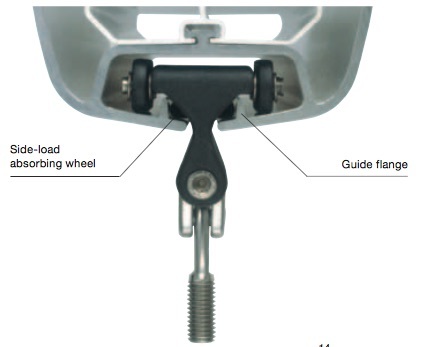 We recommend a fender board to keep allow your fenders to slide easily up and down rough lock walls. This can be as simple as a couple of 2-by-4 boards 8-feet long. Drill a hole vertically so you can put a line down through the board and it won't chafe rubbing on the wall. So you have designed a secure way to mount the mast, made a couple of fender boards, and designed a schedule to get you south. Now prepare to enjoy the canal journey! Check out our How-To video below for more hints and a taste of the trip through the Erie Canal. 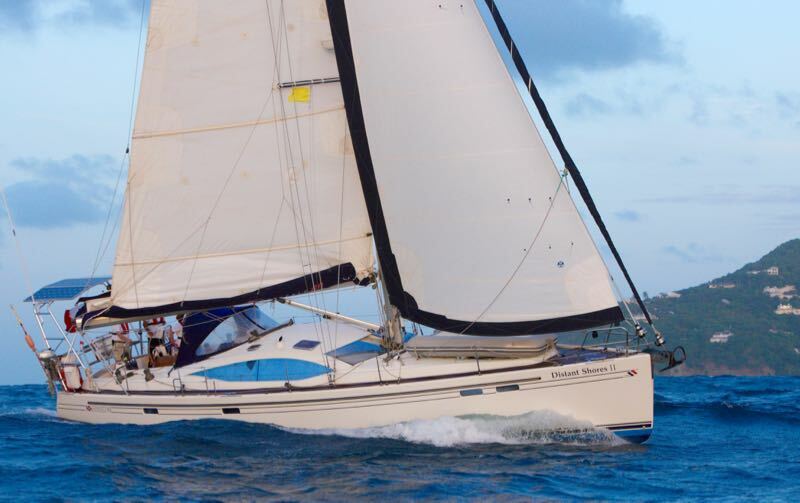 What sort of mainsail setup is best for long-distance sailing? 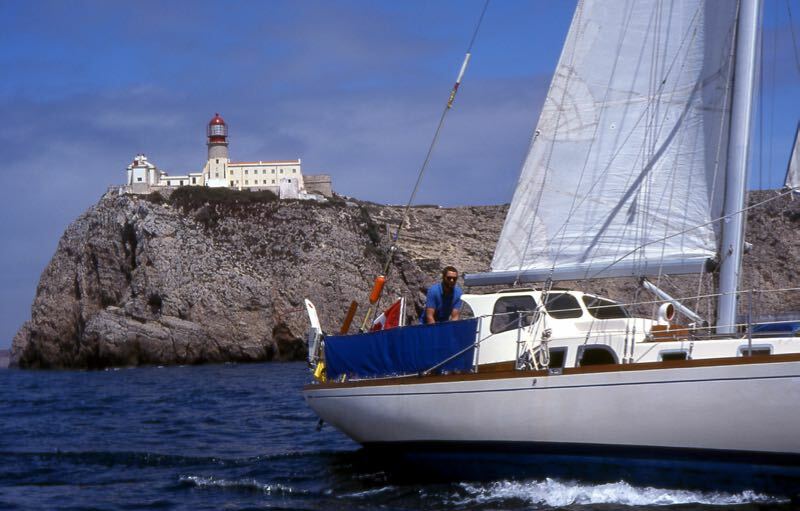 On our first cruising sailboat - the 37 foot Two-Step - we had full battens and a rudimentary single-line reefing system. You can see the deep first reef in the picture below. By pulling the single line in the cockpit you would bring both reef points down to the boom using a pulley system hidden in the boom. Unfortunately the sail-slides were just plastic and regularly broke. Also the single line system tended to get tangled inside the boom since the pulley system would spin around and add friction. Regularly we had to try to untangle the lines. 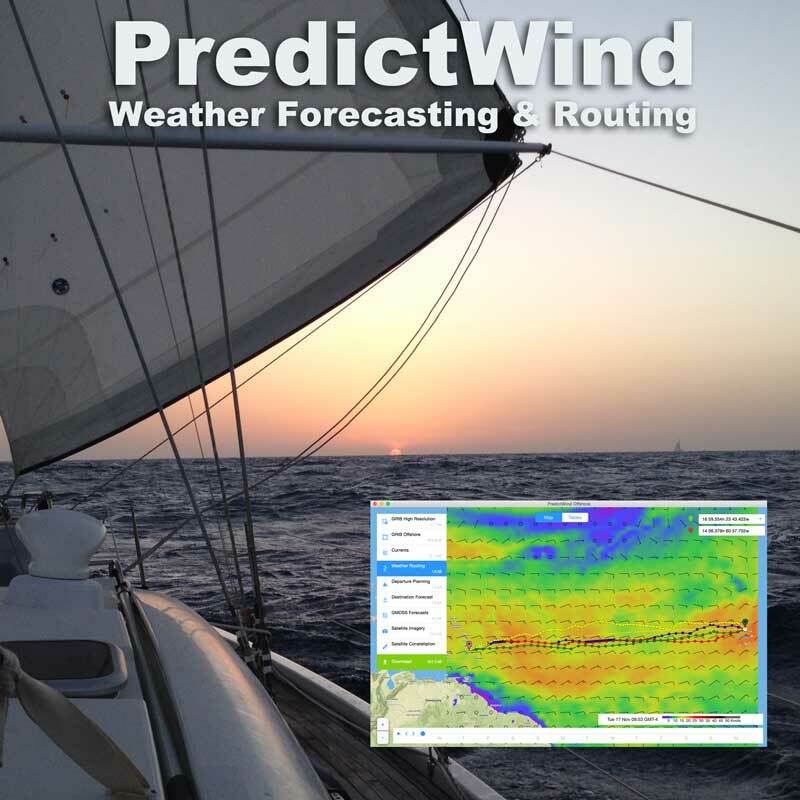 We also have this on the Southerly 49 and this system works VERY well. The cars slide easily, never bind and are quite strong. We carry a couple of spares, but in nearly 50,000 miles with this system we have only broken one car. Reefing is similar to our original "single-line" system but with an important difference. The Selden system involves a car in the boom that cannot become tangled as it could on our older system on Two-Step. Basically the car moves back and forth inside the boom such that it can't rotate and twist. Clever solution to the problem. Here's link to Selden's website describing the system. This system allows you to have 2 reef points, each reefed with a single line from the cockpit. We also have a third reef, but this can't be done the same way. We have that as a traditional jiffy-reef. We have never sailed offshore using an In-Mast or In-Boom furling solution, but I confess I have often wondered if its time to give them a try. In-Mast systems seem the most time-tested, and many boats have circumnavigated with this. 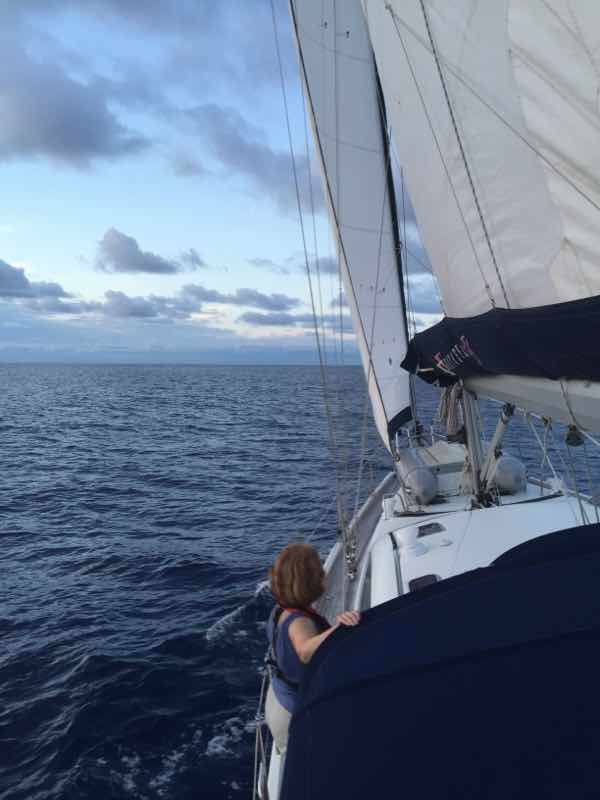 On our last crossing there were numerous boats on the ARC with in-mast furling and I envied how easy it would be to reef in our out so easily. Here is a big Hallberg-Rassy 54 with a Selden inmast furling system and a full batten mainsail. Disadvantages include added weight aloft and the potential for a jam if something goes wrong. If you want to cruise, but cruise FAST... read on! 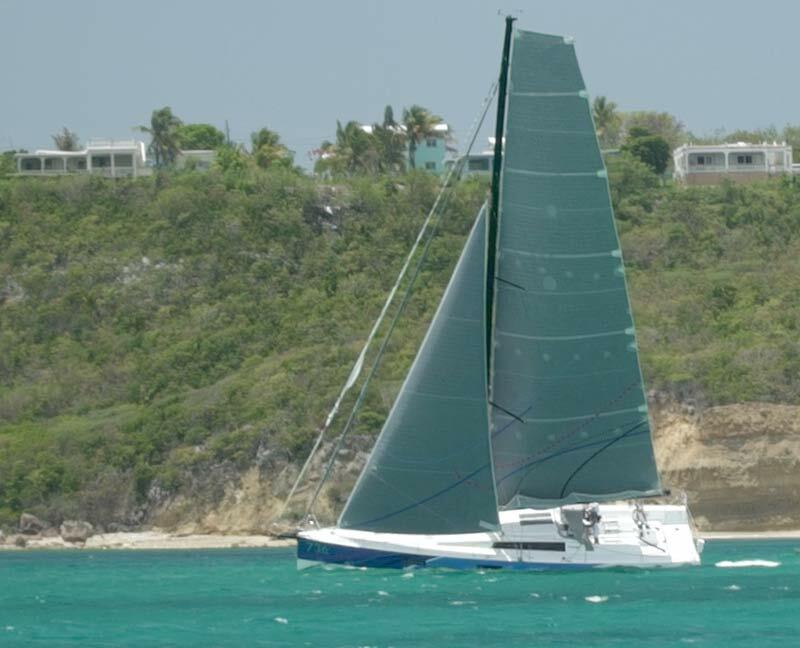 I got a chance to sail on a Pogo 50 last week in the Anguilla Regatta. For the first day of the regatta there was lots of wind, and we photographed the race from the press boat. On the second day I went out aboard the Pogo 50 for the race. Thanks very much for having me aboard guys!! 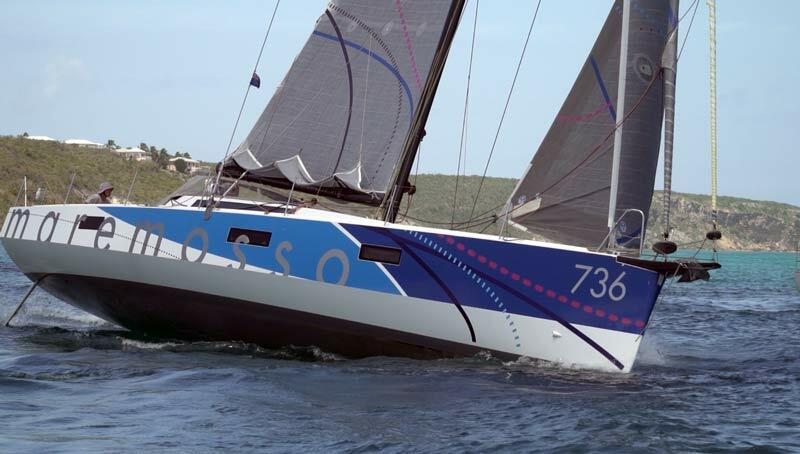 In case you haven't heard of Pogo, they are a French Boat builder (not a child's toy :-) specializing in very high performance monohulls. For years they have built Mini-Transat boats, 6.5 meters long (20 feet) and then grown to 30 and 40 footers. Always high-performance! But now they have branched a little more toward cruising with the new Pogo 50. A Pogo 50 is still very much the high performance craft, but set up for cruising. 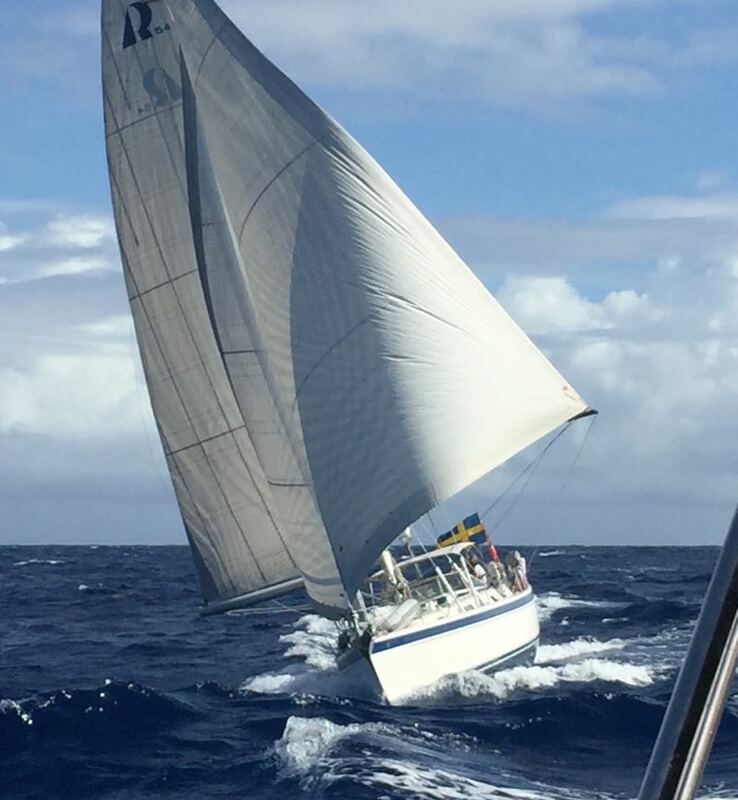 Appropriately Pogo 50 Maremosso (which we met in Anguilla) was on an Atlantic cruise, and just entered the regatta for fun with their 4 crew. Both the Pogo and Southerly can raise their keels for shallow water. The Pogo's draft with the keel down is just a foot more than ours at 11'5. Raising the keel for shallow water our Southerly draws just 3 feet, the Pogo less than 5. 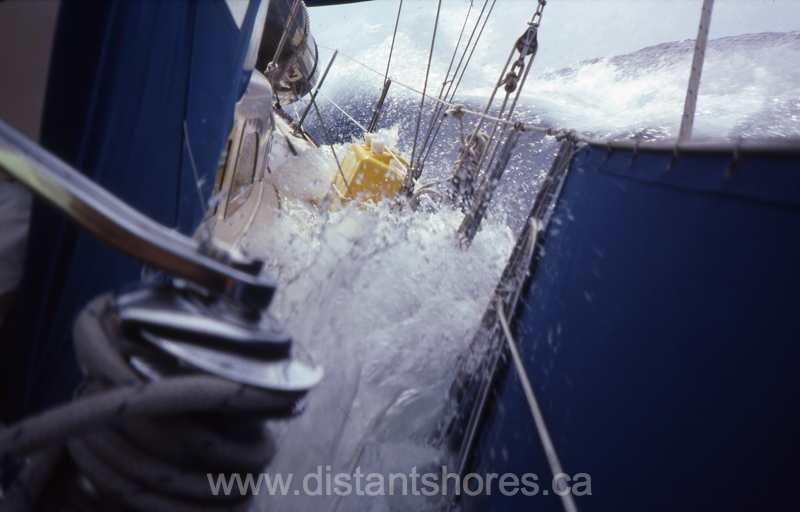 The difference here is she keeps much of her ballast in the bottom of the swinging 3 ton keel. We have a 3 ton plate in the hull which we can sit on when we have swung up our 2-ton keel and are beached. The Pogo must not be grounded like this I think or would risk damage as the keel is external even when swung up. (Image from YBW.COM) Both the Pogo and Southerly also have twin rudders. Pogo mast is 6 feet taller than our Southerly. 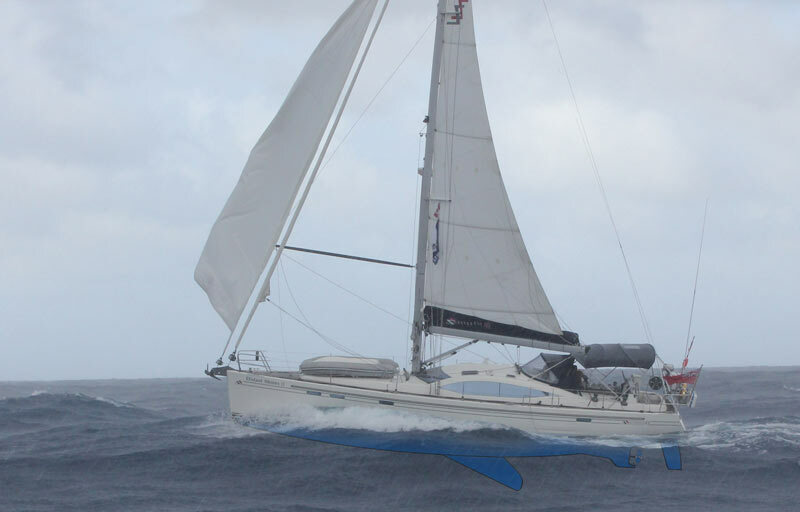 She has quite a bit more sail area in the main however, with the high performance "fat head" sail configuration. Even the interior layout is similar with the main cabin forward and two aft cabins. The biggest difference is the displacement. The Southerly 49 is nearly twice as heavy! Inside they have simplified to keep it light, but do have a workable cruising interior. 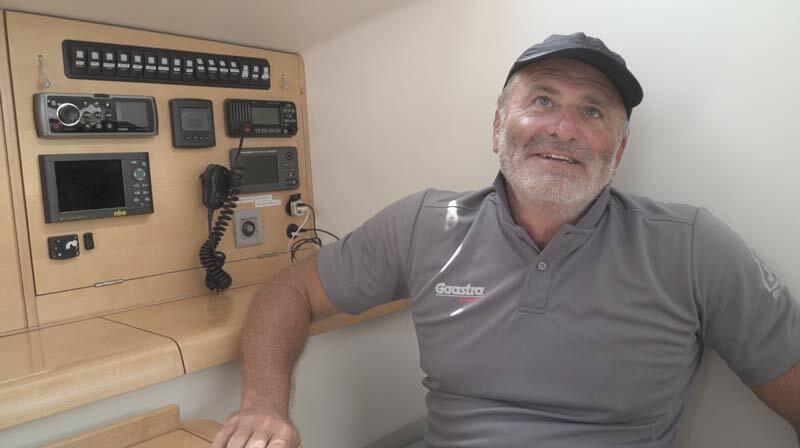 Here in the well-organized nav station, co-owner Guido describes their successful Atlantic ARC crossing (finished 17th). The interior (shot here from the Designer Finot-Conq website) is quite light and airy, and light-weight as well. 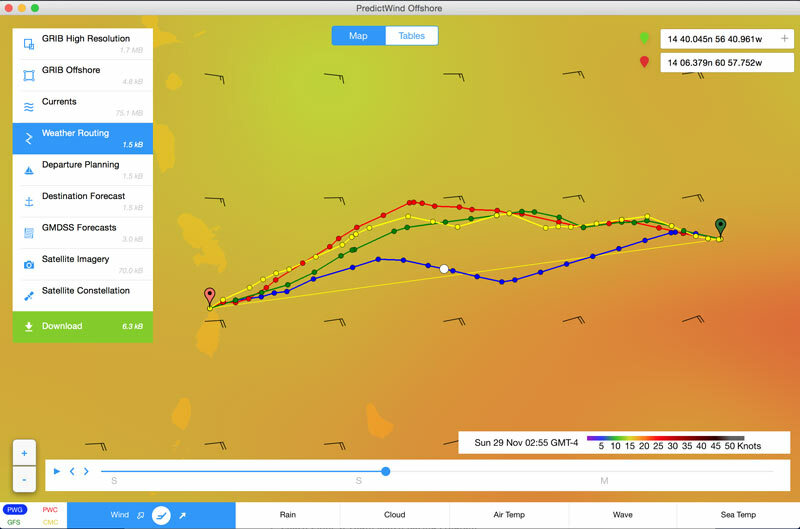 It was unfortunate that we had very light winds the second day of the regatta when I was racing aboard Maremosso. 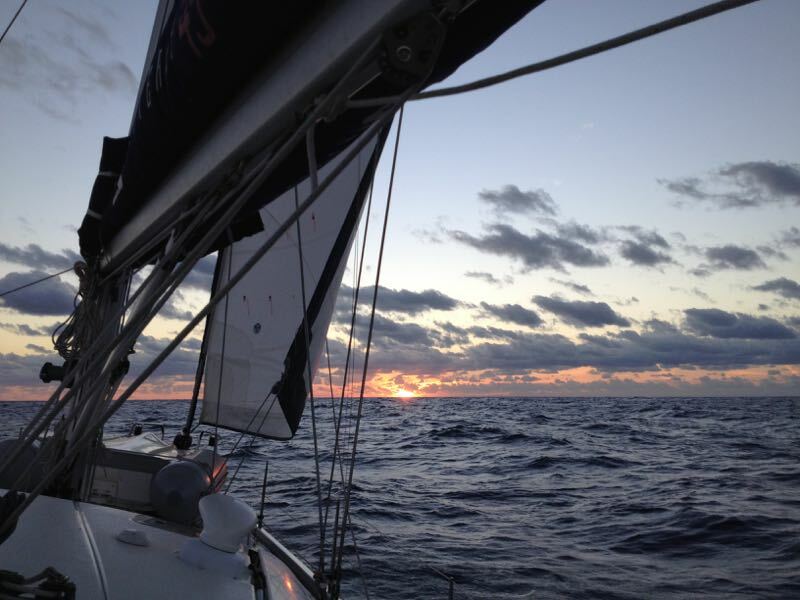 I had watched her roaring around the course the previous day, only to find light flukey winds for my day on board. Nevertheless it was obvious that this is a VERY fast, fun and responsive boat to sail. When even the slightest puff stirred the water we zipped along, but the crew was frustrated they couldn't really show her stuff! Down here in the British Virgin Islands we see a LOT of catamarans cruising around. Many of them look specifically designed for the charter trade with MANY cabins and heads and opening patio doors. But some are much more purposeful and look like they might make a good "Around the World" cruiser. One that has caught my eye recently is Outremer. 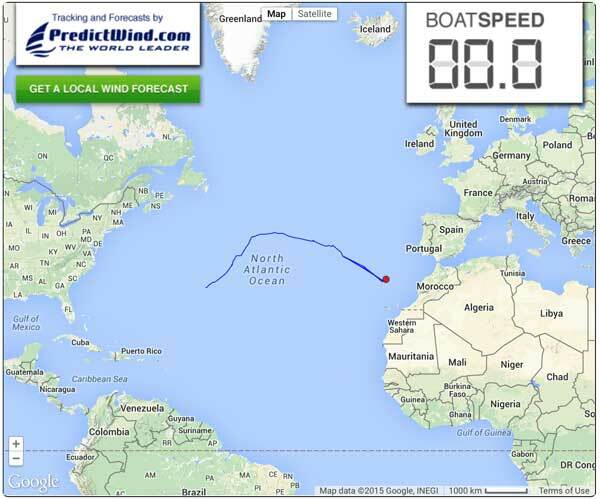 Might this boat be good for our round-the-world journey? Comparing catamarans to monohulls is difficult. Catamarans cost more to build for the same length. Two-hulls, two engines, more accommodation, etc. 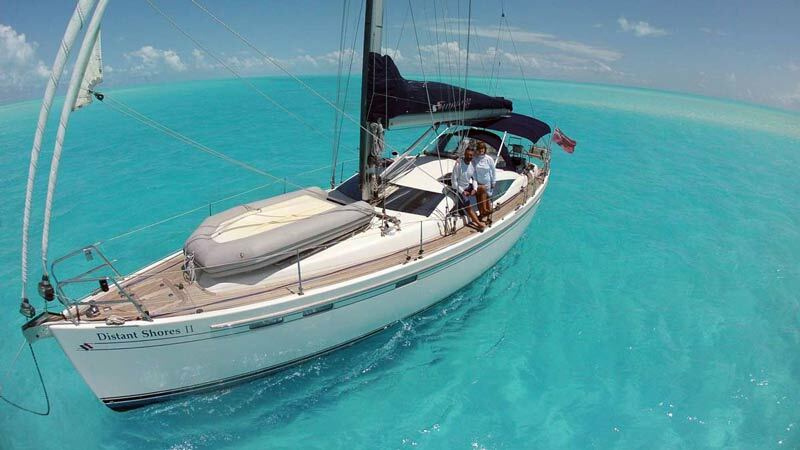 so it is usually better to compare, say, a 46 foot monohull to a 40 foot catamaran, since pricing will be more similar. 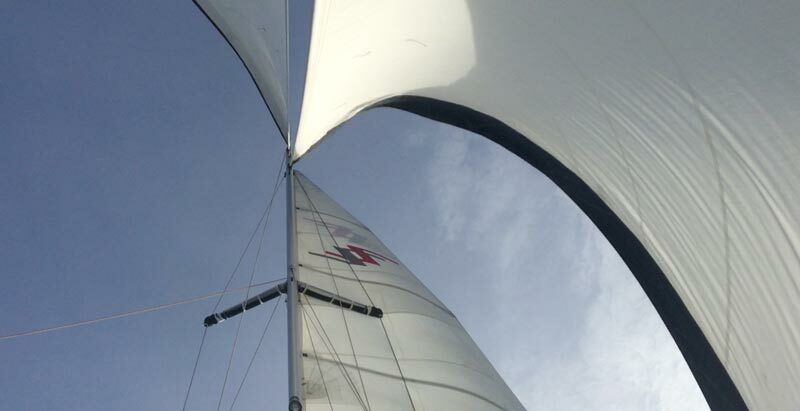 Monohulls heel over when sailing upwind. Although cats do not heel over they do bounce around in a seaway. Motion is different, and for some people, mono-motion is preferred. And some people prefer the motion of a cat. Of course within monohulls the motion of different boats is quite different. Although there are other factors, a longer waterline generally means a smoother motion. In my experience cats tend to have a slightly more complicated motion as you have two hulls each in different waves. Catamarans definitely have more interior space. So if you like big spaces, the cat will be great. But be aware you shouldn't necessarily fill up all that storage space. 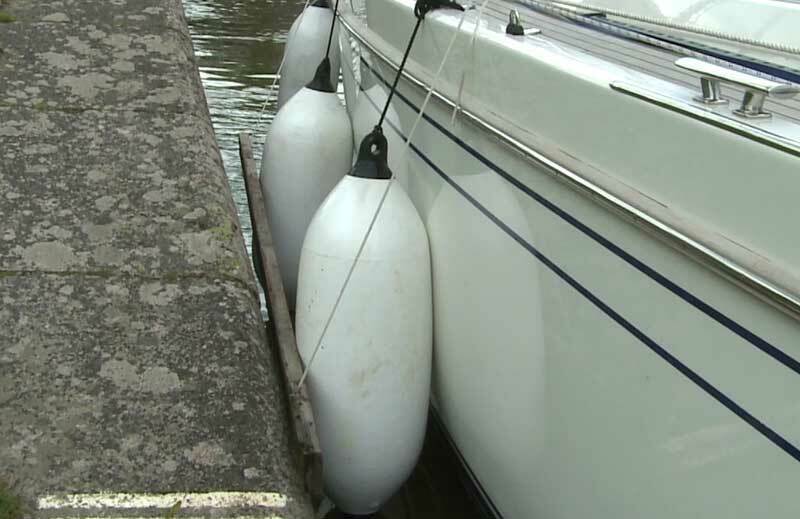 Any boat will suffer from overloading and may even get dangerous. No boat likes to be overloaded but catamarans suffer perhaps more. Moving onboard with "all the stuff" lowers speed and performance on both mono's and cats. In some cases it comes down to what you feel is right. 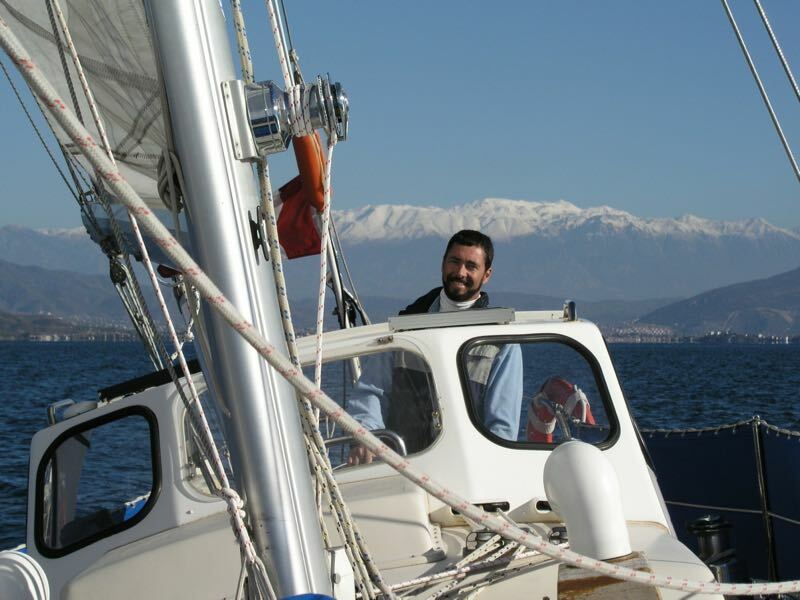 Do you like catamarans? I have even heard people say a catamaran is "just not a proper boat". 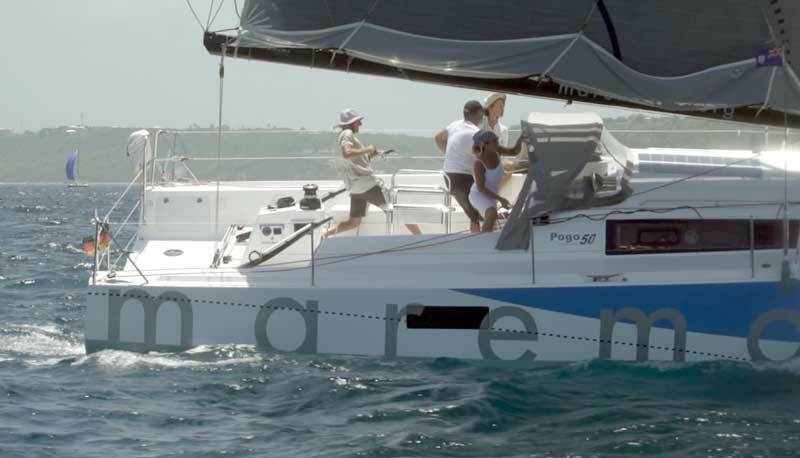 And of course catamaran people refer disparagingly to monohulls as "half-a-cat". 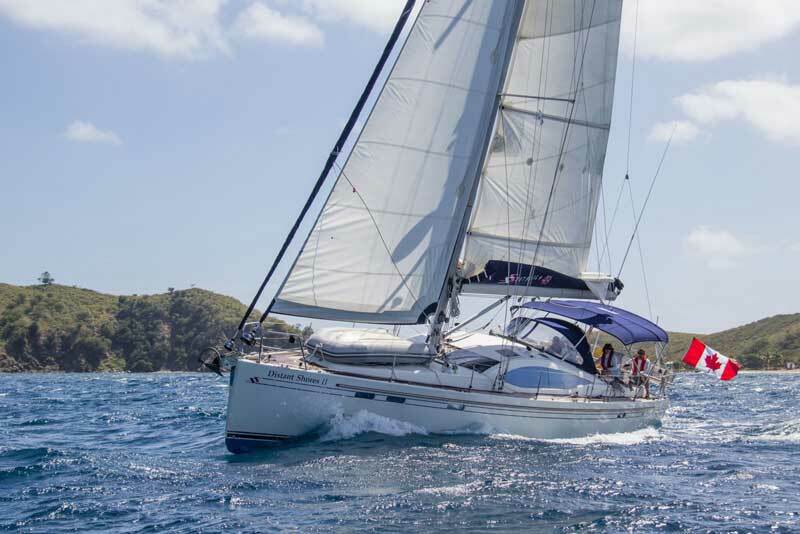 I have always like monohulls, but was quite happy on our week in the BVI chartering a Lagoon 380 (which we filmed in Season 5 here). 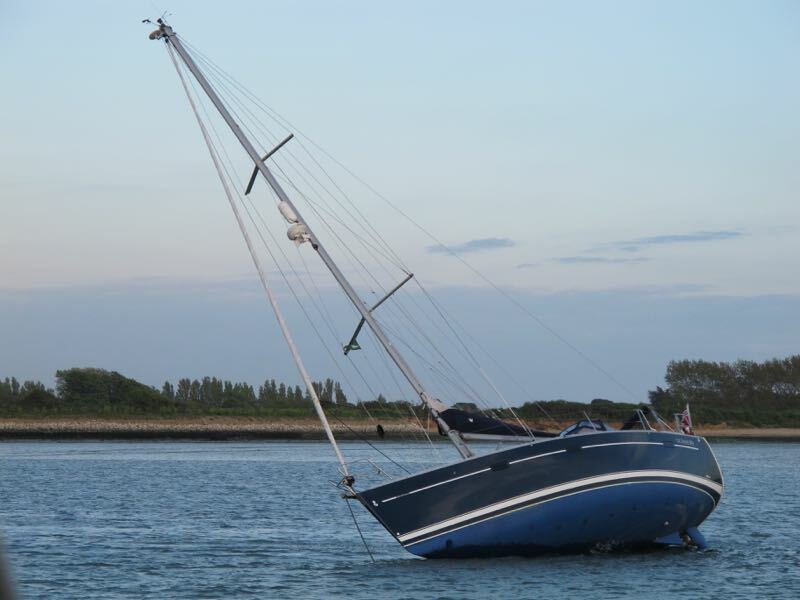 Catamarans do not heel over when sailing. Of course as the wind increases there is a point when they will lift a hull. For a racing boat this means an increase in speed, but for a cruising boat this is not recommended. Best to reef before the wind reaches the force where the boat is overpowered and "lifts a hull". For those of us used to sailing mono's there is an adjustment to sailing style. You need to be sure not to overpower the boat. Charter cats sometimes are built with shorter masts to make them safer to sail. Owner-Versions might have a higher performance rig. In either case you may need to get used to "sailing by the numbers". 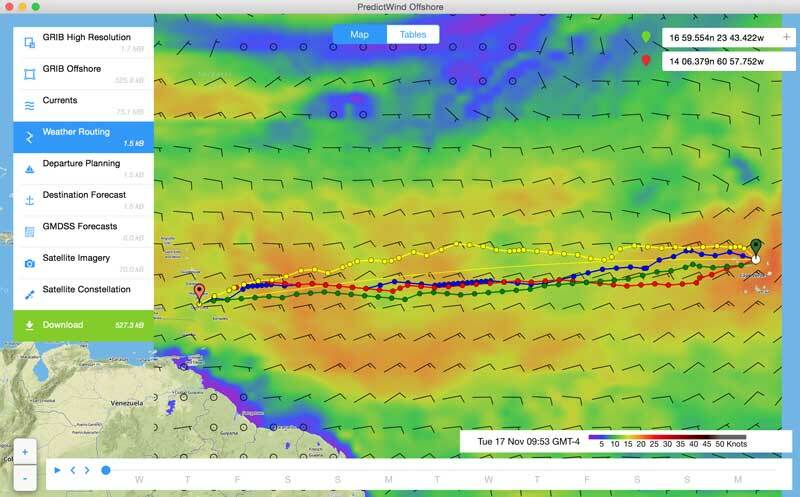 So if its up over 20 knots its time to put a reef in even if you're sailing quickly, since its hard to tell how close you are to the edge. In the mono, your rail would be in the water and you know its time to reef :-) Sailing by the numbers may not be for everyone. Could Distant Shores III be a Cat? 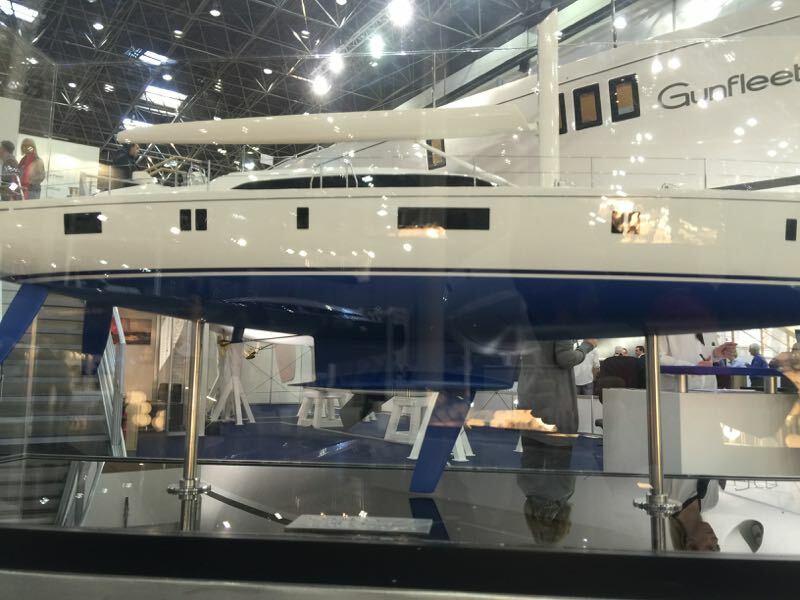 From our quick look around the Outremer 45, I was impressed. Racy and seaworthy looking, she apparently racks up some impressive runs offshore. Who knows?? What do you think? 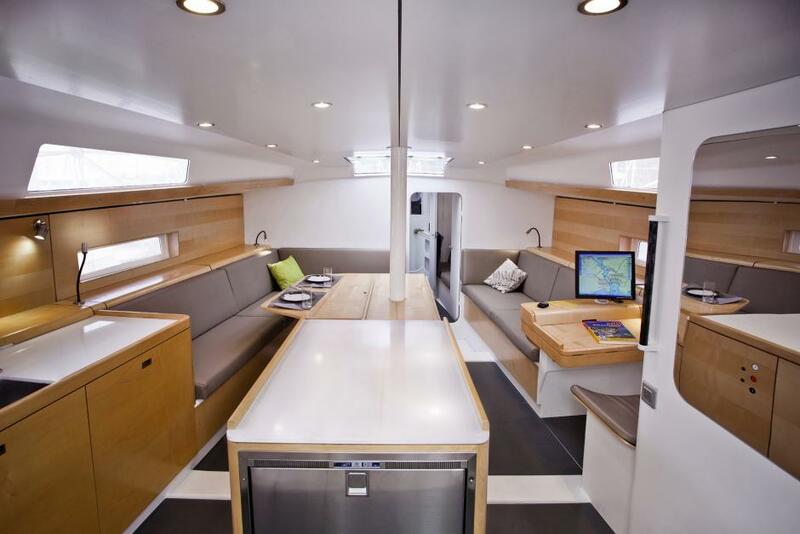 Would a catamaran suit your cruising style? 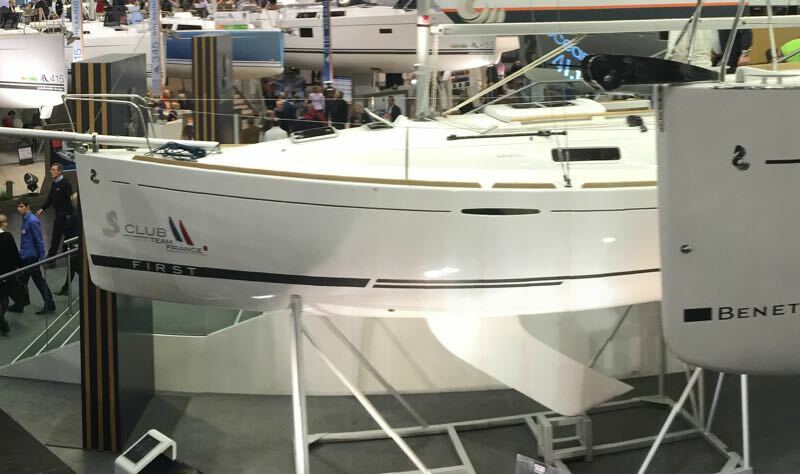 I went aboard a number of boats looking to see what's new … Beneteau, Jeanneau, Dufour, Hallberg-Rassy 43, Sunbeam, Oyster 575, Garcia 52 Exploration, Faurby, Nordship, Bavaria Nautitech 40, Delphia 46DS, Allures 39, Linnsen and more! If you are interested in buying a sailboat, this show has got to be a "must-stop" on your tour. In fact, if you get to Annapolis and Dusseldorf you'll probably see most of what's worth seeing. 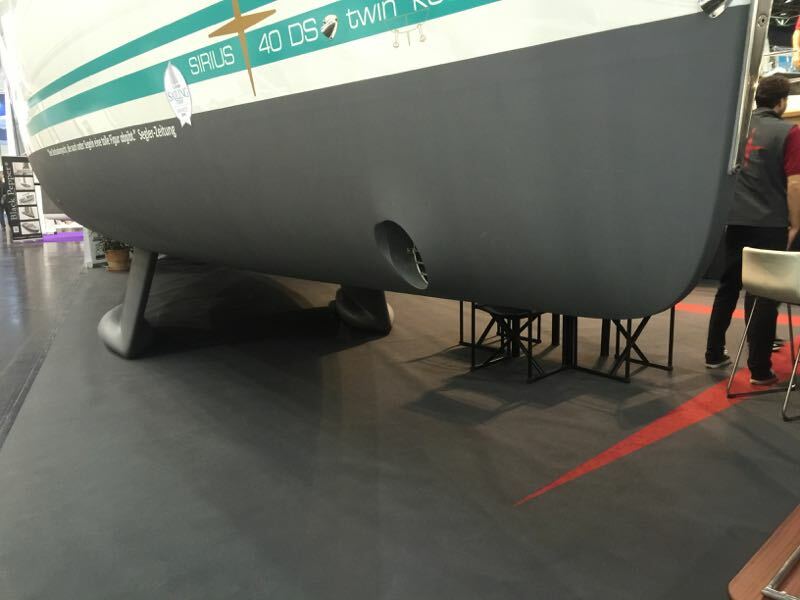 I was keeping an eye out for interesting keels - extra good when the boats are out of the water at indoor shows like Boot Dusseldorf. 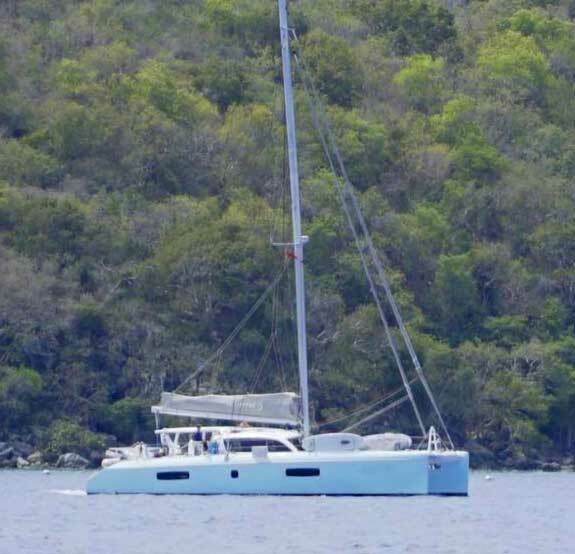 Here is the Sirius 40 with a twin-keel. Twin keels are not renowned for amazing sailing performance but they are a very good solution for sailing in a tidal area where you will need to beach the boat often. 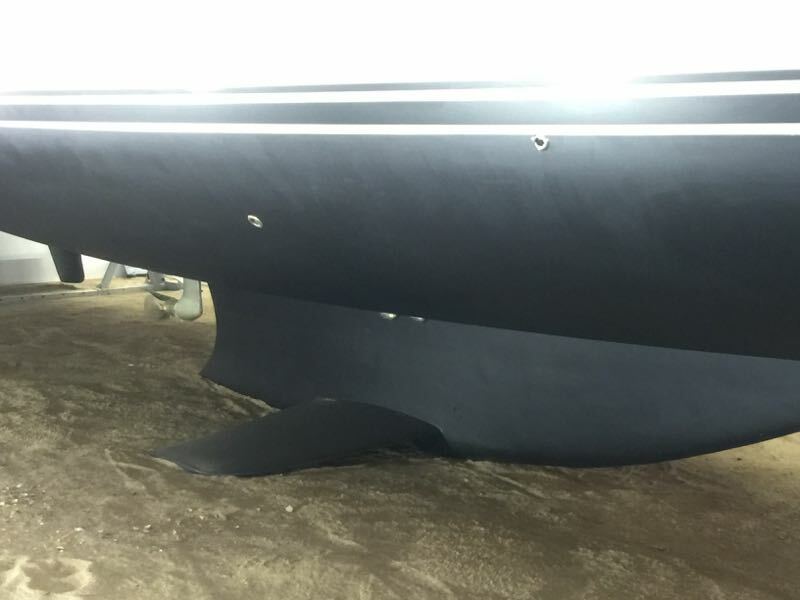 But if you need shallow draft (like Bahamas) they aren't such a good solution since they are about halfway between a regular keel and a flat bottom keel version. More of a "shoal keel". 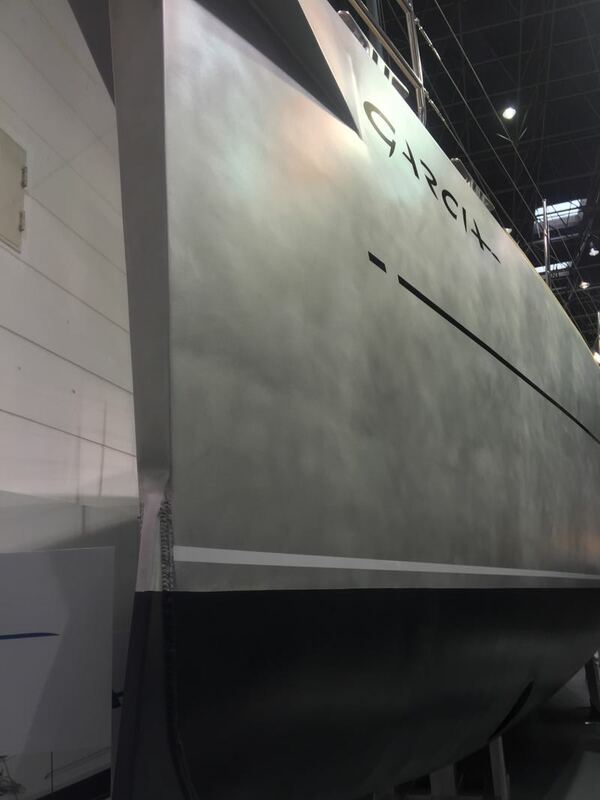 For the Sirius it draws 1.4 meters VS 1.5 or 1.75 regular keel. 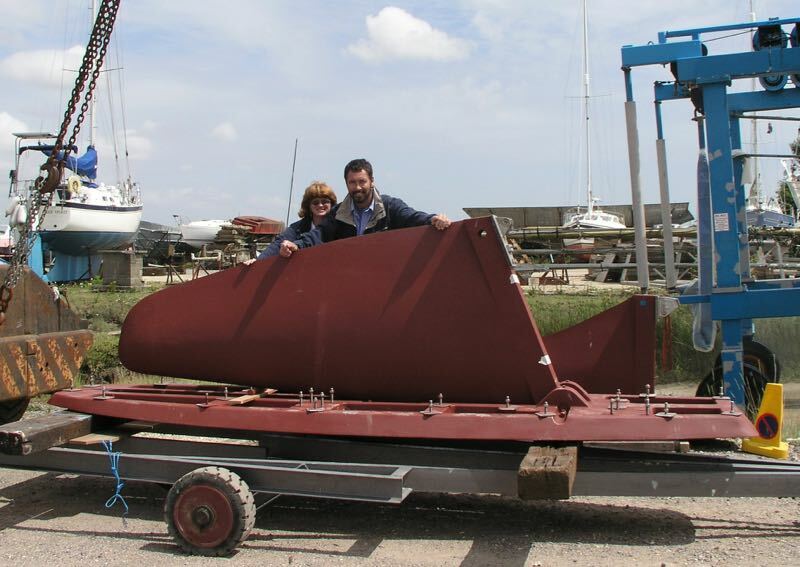 Here is the Delphia 46 shallow winged keel with centreboard. 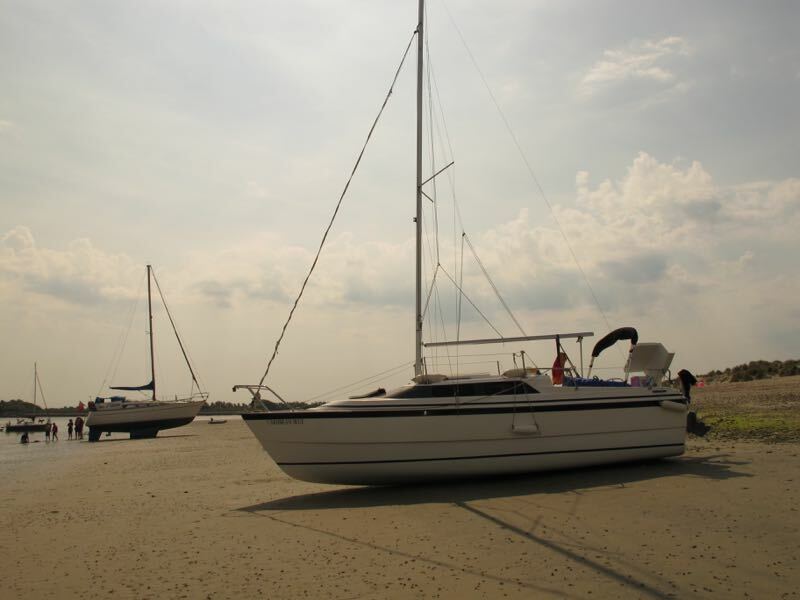 The boat is beachable as Delphia say the keel is plenty strong enough to rest on the wing. She is pretty shallow as well drawing just 1.3 meters (4'4"). The centreboard swings down from the keel to extend the draft to 7'. I filmed this review of the Delphia factory and a quick test sail on the 46 a few months ago. Allures lovely hulls are made in aluminum by Grand Large Yachting, the somewhat redundant name of the company that also owns Garcia (below) and Outremer catamarans. 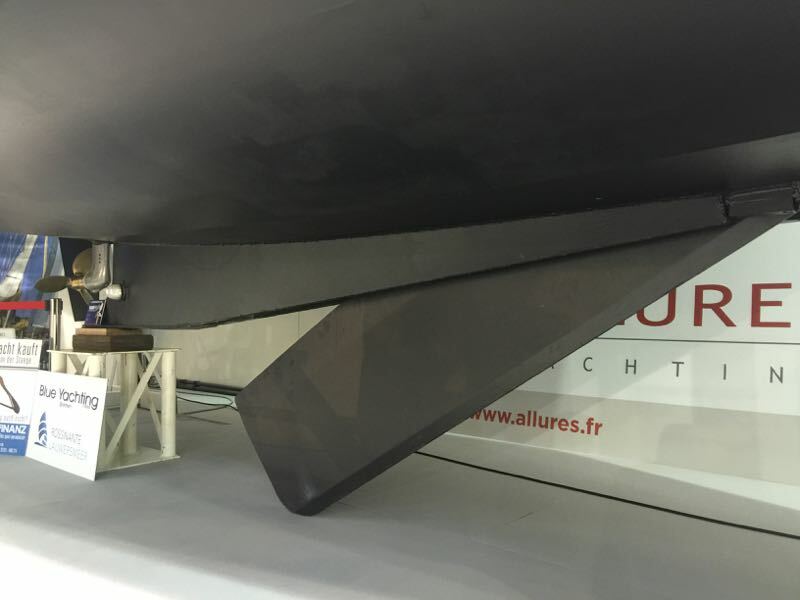 Allures have very fair aluminum hulls, but the decks are made of fibreglass. This allows for the toughness of aluminum in the water but the versatility of fibreglass in the complex shape of a deck. They have a very shallow centreboard so this 39.9 footer draws just 3'6" or 1.1meters. Here is something different. It's a swinging keel that stays outside the boat when you swing it up. It doesn't disappear into the hull or centreboard casing as most others do. Presumably this is so the interior can be the same for versions of this models. Here is one of our first times beaching the Southerly 42 in the remote Bahamas. Southerly's keel arrangement. This is the keel from our current Southerly 49. It uses a 2-part system total ballast 5200kg. The swing keel (weighing a hefty 2 tons) is in the raised position in this photo below. The rest of the ballast weight is in the grounding plate, which will bolt into a recess in the bottom of the boat. 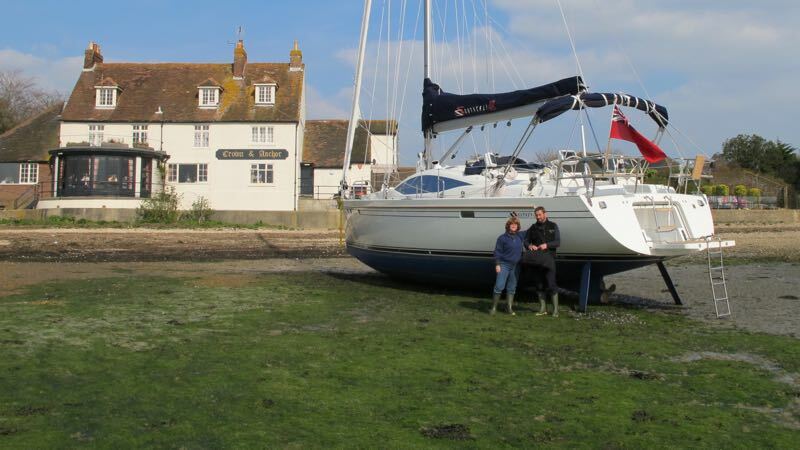 In areas with high tides many boats "take the ground". This is a beach in Chichester England where tides reach 5 meters (16 feet). 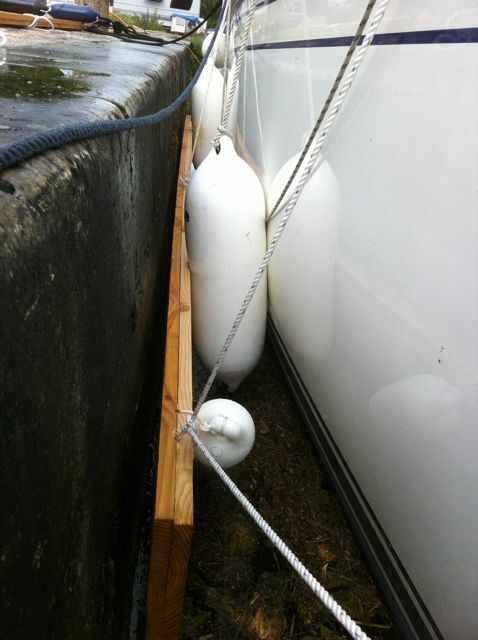 A Beneteau with a standard deep keel who shouldn't have anchored so close to us… oops.